Make time for modern elegance with this unique 20” Empire Wall Clock. 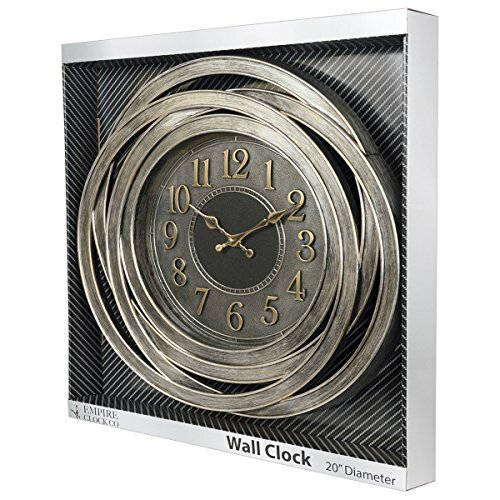 With its unique woven metallic disc styling, this 20-inch wall clock seamlessly blends the antique and the modern into a functional decoration in league of its own. With an almost Jules Verne-style aesthetic, the antique silver finish lends an authenticity to this timepiece: like a relic from a past that never quite existed. Perfect to mount above fireplaces, mantles, or on any wall that could benefit from its steampunk, retro-futurist design. Perfect to mount above fireplaces, mantles, or on any wall that could benefit from its steampunk, retro-futurist design.